The process of replying received QSLs will start after the Easter holidays. So everybody should receive his card within the next three weeks. Direct QSLs with 3 US-$ via DF2ZC ONLY, together with SASE or address sticker (the latter is the preferred way for USA stations as a SAE is of no use due to envelope format). You can also request your QSL by sending us 3 US-$ via paypal (see button at the right). No need to send your own QSL. Please do not forget writing QSO details in the comments field. The EF9LZ activity is finished. With 178 QSOs the number of contacts is far higher than we had even dreamed of the first evening when we realised the actual noise situation on site. We cannot imagine many worse things than knowing that many ham friends are copying us well while we do not have copy from them in either polarization due to the high nose floor. Luckily at times it was so much better like on the 16th and 17th when some hours it felt like a “normal” DXpedition in normal noise situation. At moonrise we always had not just a hill but also a big tree between us and the reflector in the sky. It felt like this tree would harm the rx side more than the tx side. This got gradually better from day to day as the declination became less and the moon rose to more southerly directions. From FK8CP we finally at least saw a sync during our last moon rise in EA9 but sadly we could not manage to complete a QSO. More or less reliably all rx signals disappeared when our moon rose above 70 degrees: Zero copy was observed in both planes, strange. And strange was also that we had nearly zero return power from our antennas. They were the same as with CR2EME or D44TU etc when we always had some 5 watts return from our Tajfun LDMOS amp. This time it was just 100 mW which normally cannot be. However, as we were copied very well and also had some loud signals at times, best 4 yagi signal was -18 from DL1DWI, best signal at all was -15 from HB9Q, the system obviously ran well. The 70 cm thing (SWR 1:2 on both antennas combined as well as on each single antenna) will be investigated. Maybe it was always that high? Then we would have made all our 70 cm QSOs with a sub-optimal antenna system at CR2EME. We had double-ckecked booms, element spacings and lengths as well as both dipole boxes but did not find even a clue. When returning home on the 20th with leaving the house at 6 am we noticed quite high winds and hoped the ferry would not be cancelled. Luckily it was not but we had quite a bumpy ride from EA9 to EA7. There we collected our rental car from the parking house (rental companies do not permit to bring their cars from EA mainland to EA9) only to realize that somebody had dented the rear bumper bar – which added some 250 € to the rental cost. Then driving 140 km to Malaga airport and catching flights home. Personally I always feel a bit uneasy at the security checks when I have to present my hand baggage with the FT857 and the 12 V power supply. You never know if you run into some poseur who takes himself very very serious. So far I have never met such a person at the security checks but you never know. This time in Malaga there was just a nice-looking young lady who wanted to know if the FT857 is something such as a police radio…no, of course not. And again nobody checked the weight of my pilot’s case which was 12 kg, way over the 8 kg limit. When carrying it you always had to maintain a face that it is a very lightweight thing hi. It also paid off to have a jacket with many pockets because the weight of the jacket does not add to the pilot’s case content ;-). With our checked-in luggage everything was fine. It sure pays off to always add a copy of the radio license and a paper with “Amateur Radio Equipment” in capital letters with contact details into every box and also on top of the entire content when packing the suitcase. Chris PA2CHR once told that he always does so – and this helps a lot, thank you Chris. A friendly smile at the check-in person also helps to avoid excess charges if you have 2-3 kg more than permitted. QSL Routes are via DF2ZC only, direct with SAE and 3 US-$ - no IRCs please. However, to keep it simple you can also send us 3 US-$ via paypal by clicking the donate-button at the top/right of this side. Please do not forget to enter QSO details! The X-Team will also go on DXpedition in 2020, most probably in March again. To where we do not know yet…but we will be on the road, for sure. Last not least: A BIG THANK YOU goes to Jorge, EA9LZ. Jorge was a big support to us not only arranging for the location in EA9 but also helping with customs and many petty things. EA9 for instance is part of Spain and also of the European Union but it is tax-free. Therefore there could have been a big mess bringing so much equipment into EA9 and particularly back to EA mainland. Jorge went with us to the Guardia Civil and explained to them. We finally received a paper to confirm we brought the equipment into EA9 before we brought it back to EA. This saved a lot of time let alone nerves. One must not forget it is very hard to find an English speaking person in administration (and also elsewhere) in Southern Spain. So communication would have been tough. PA5Y, F6CVY, DK5EW, DM1CG, OK1VRY, UX0FF, CT1EIF, OK1IL, OK2PMS, HB9Q. This morning after had swapped the 2m for the 70cm antenna we had a bad surprise: When checking SWR it was consistently 1:2. Checking each individual yagi both also showed 1:2. We measured thematching boxes at the dipols - both ok. We controlled phasing lines (which could not be the reason because both yagis showed 1:2 each) - all ok. Elements were mounted in correct sequence and correct distance from one another. We did n ot find any clue for this weird behaviour. The antennas worked ok with CR2EME last year and were lying in DH7FB's cellar since then. We did not want to take the risk of killing our 250W sspa for 70 cm so swapped back to 2 m.
Bad luck for the few 70 cm guys who missed out on EA9 when Zdenek OK1DFV was QRV from here in 2017 but what else could we do? On the other side good luck for 36 2m stations which we did not work yet. Though we still feel a little like having let down the 70 cm guys. After moon rise the usual behaviour we know from the past days: We were being copied well but we have a poor reception, beaming through the big tree in rise direction (Do trees have stronger negative effects on reception but on transmission signals?) Once we got clear of the tree the fun began. Though the high noise floor of course did not go away we sometimes had big rx signals (best was DL1DWI with -18) and worked yet another two single yagi station making it three altogether (R3PA, DL1VPL, DK5AI). At times we had S9 QRM, sounding like voice signals. This was the first time since we started here. Maybe it had to do with the military (gun?) shot noise we heard all morning, maybe there was some kind of exercise? One should not forget that Ceuta is 90% military. Anyway, we are very please with the results yesterday. Though strangely when moon is nearly on top of us we did not copy anything in neither polarisation and went QRT after 45 min NIL and moon approaching ares where he is being blocked by neighbouring houses and hills. Next moon rise (0 deg) is 1702 UTC. As the moon is rising a little more to the South every day now we might catch him earlier (at lower elevations) than before. We plan to be QRV until 21Z at the very latest because we still have to break everything down after QRT - and the taxis is collecting us at 6 am the next morning. 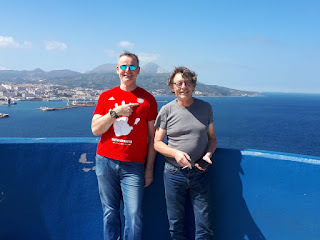 We then need to catch the ferry back to Algeciras on Spanish mainland, collect our rental car from parking, travel to Malaga and fly home from there, taking off at 1440 UTC with LH1149 to Frankfurt. JH2COZ, JA5EEU, G8RWG, DK9WI, DL8SCQ, SV6KRV, G4DHF, LY2IJ, JH0BBE, F8DO, ZS1LS, DL1VPL, OT7K, DF9UX, DL1DWI, G4YTL, YO3CBZ, SP2FH, LY5E, OH2BNH, YL2OK, G4FUF, OH6UW, EA5SE, F5AQX, EA5CJ, DL1KDA, SM4GGC, PA1GYS, DF9KX, SM2IZO, GM6JNJ, DK5AI, HB9AHD, K9CT, OH6ZZ, PA3DOL. After we had swapped the 2m for the 70cm antennas this morning we tested the SWR, as usual. It was 1:2, on both yagis combined as well as on each single yagi: very very strange. We carefully checked all cableing in the transformer boxes as well as elements and spacing. There was no obvious mistake. And the antenna had performed well with CR2EME 2018 and D44TU 2017. Since then it was just being stored in DH7FB's cellar. So we did not know what else we could do. Therefore with a heavy heart we decided to swap back and be QRV on 2m again today. We feel very sorry for those needing EA9 as new DXCC after Zdenek OK1DFC successfully activated this DXCC in 2017, particularly Peter PA2V and of course Zdenek himself. 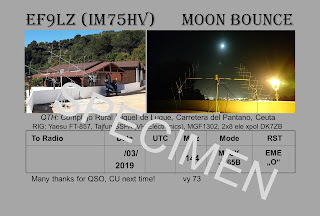 So cu at our moon rise on 144,114 MHz EF9LZ tx 1st, around 1630Z today. This activity will certainly not be the one we had the most fun: Always fighting with a permanently present noise level degrading our rx performance while knowing many ham friends are desperately calling us and hoping for us to return with their callsign is no joy. Here it was always a question of how to minimize the noise effects. Luckily we could mitigate that problem a little after day one finding an inhouse noise source which we could stop. Without it we would maybe have made some 50 QSOs altogther only, now we are at least at 126. To make things worse were were called on tropo by some EA7 stations which made reception of EME impossible. Though we replied their JT65 tropo call they continued calling us, apparently not having decoded our reply or not knowing how to react to this strange OOO report. Some 30 minutes were lost with an issue of our switching logic for hpol/vpol but at least that could easily be rectified.